Disclosure: The Barbie ‘Potty Trainin’ Taffy’ mentioned below was provided for me in order to facilitate my review. All opinions are my own and honest. I am disclosing this in accordance to FTC Guidelines. Please see “Disclose” tab for more information. My girls are finally reaching the age that they like to play with Barbies. I must mention that I am very excited about this stage that we have finally reached. 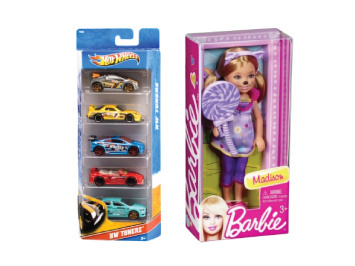 I loved Barbies as a child and I have been very excited about all of the neat Barbies that are available now. I was lucky enough to be able to receive Barbie Potty Trainin’ Taffy to do a review on. Barbie loves her dog Taffy. Taffy is absolutely adorable with her pretty pink, removable collar and flopped ears. 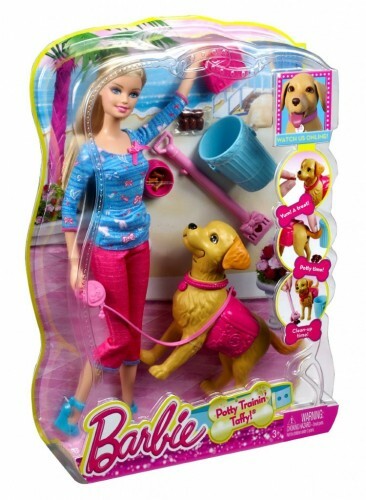 Your child will have the opportunity to help Barbie care for her dog with the Barbie Potty Training Taffy set. The set includes everything that you need to properly handle the basics: feeding, walking, and cleaning up. Feeding Time: You can start out with a box of treats that fits perfectly in Barbie’s hand. You can put the bones in the dog bowl, or feed them straight to the dog and you can store them in Taffy’s pink backpack. In less than three weeks, we will need to make sure we have those Easter baskets ready for the kiddos as they wake up. We usually give Little Man only a little bit of candy, like his favorite Peeps, and then the rest we fill with cute Easter and spring toys. Check out the “Save the Bunny” promotion from Mattel.